The problem with a nice, specific, memorable name like Ringly is that Christina Mercando d'Avignon's smart jewellery startup was never going to stick to smart rings. Ringly's first smart bracelet collection, known as Aries, is now available for pre-order for $195 with shipping set for this summer – specifically August if all goes well. It does everything Ringly does: handling alerts via vibrations and an LED light, helping busy women and young mothers filter out which notifications they want to receive with both iOS and Android compatibility. But it also adds step and fitness tracking into the mix. "That was a highly requested feature from our customers," Mercando d'Avignon told us. "They would come back to us saying – I love wearing the step tracker I have but I don't like the way it looks. "And again, some people don't wear rings. It's funny with the feedback we get because when we talk about fashion, it's very much a question of individual taste. So we get questions all the time – 'Can you do a piece with turquoise? Can you do one with silver?' We get requests all the time but bracelets was by far one of our biggest requests. From day one, it was always our mission to create accessories that were smart but we wanted to nail the small form factor first." The initial gold-plated Aries bracelets come in two different styles: a "casual, modern" style with a pyramid stud, and the more "elegant" option with a diamond accent on the side. The semi precious gemstones available include lapis, tourmalated quartz, rainbow moonstone and labradorite, and the final retail price from the summer will be $275. We haven't had a chance to see the new bracelet collection yet but look out for hands-on impressions and an Aries review by the summer. Elsewhere, redesigned internals mean that battery life is extended from up to 48 hours to "two to three days", there's a more powerful chip plus a three-axis accelerometer inside to handle the fitness tracking and Ringly users no longer need to keep the companion app running on their phone. "The secret sauce is being fully integrated because all these different things have to work seamlessly together to make a product that's really magical," Ringly's CEO said. "We're still a pretty small team for what we've been able to accomplish. We're 15 full-time right now and we have a number of part-time people. But everything from e-commerce to jewellery design and hardware has been built internally from the ground up. That's what a lot of these other wearable companies struggle with." Steps, estimated calories and distance will be displayed in the Ringly app, and users can set up alerts for when they hit daily targets. The bracelet will also sync with HealthKit on iOS. Ringly's CEO is looking into sleep tracking for a future firmware update, though she's "not sure about the use case of people wearing jewellery in bed." As for the future, Ringly will launch new collections seasonally, as it did with its Rhodium collection in the autumn of 2015. And its next product, which Mercando d'Avignon says will be announced late this year to ship in 2017, will handle NFC payments, thanks to Ringly's partnership with MasterCard. "Payments is in our roadmap for this year, most likely announcing the designs later this year and shipping in early 2017," said d'Avignon. "But it's a really exciting feature set and a seamless experience. Anywhere you can now pay with Apple Pay or Android Pay, including the metro in some locations like London, you'll be able to just tap and pay with your ring. We're going to be putting payments into all future lines." So far Ringly has done the exact opposite of fashion companies playing with tech and tech companies thinking they can dabble in fashion accessories. It isn't launching too many products, it's listening to its customers. Sure fitness tracking is a bit of a me-too feature but hey, Ringly's users asked for it. And that's what Mercando d'Avignon sees as her secret weapon in the shift towards smart jewellery and clothing. "You can't lose that sense of brand or community that you're trying to build around your product and maintaining those relationships with the customers," she said. "When we launched the Rhodium stone collection in October, about 25% of purchases were repeat purchasers who already had another style." 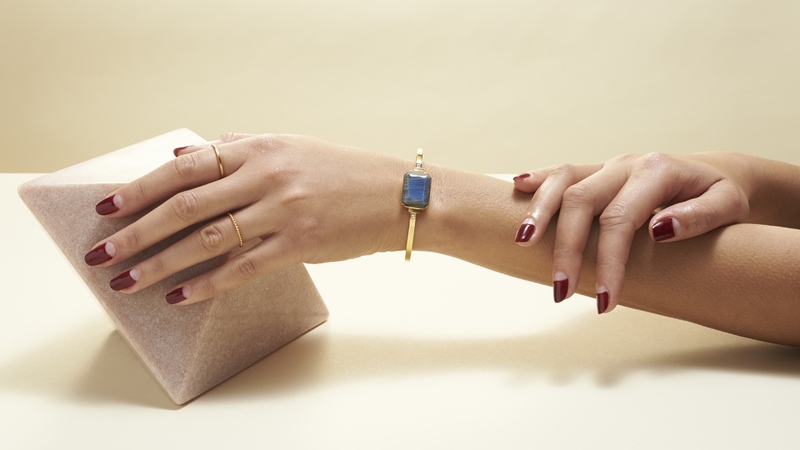 We're sure Ringly's CEO is hoping for more repeat customers with this second piece of smart jewellery. The Aries smart bracelets are available for pre-order now and the first 1,000 customers get a real diamond on the side of the jewellery plus membership to Ringly's Diamond Club.